‘Twas the night before school started after winter break, and a certain mummy was excited about getting back into a routine. Not only can I make this skinny vegan lasagna ahead, but also it will often be enough for two meals! A healthy, veggie-ful, make-ahead meal that your kids will gobble right up. Step 1: Preheat the oven to 425 degrees F and adjust a rack to the center. 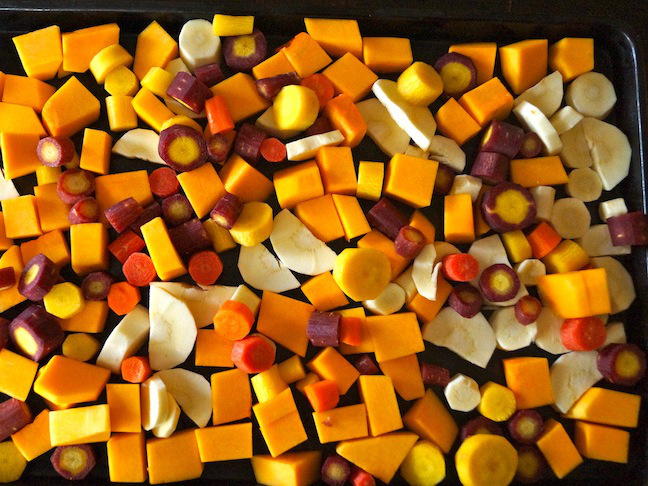 Step 2: Add the carrots, parsnips, and squash to a baking sheet. (I used rainbow carrots.) Drizzle with ¼ cup of the olive oil, use your hands to toss everything together, and sprinkle generously with salt and pepper. Then spread everything into one even layer. When the oven is preheated to 425 degrees F, place the baking sheet on the center rack and roast until the vegetables are golden brown, about 30 minutes. Use a flat-bottomed metal spatula to turn them halfway through the cooking process. Step 3: When they're done, remove them from the oven and set them aside. 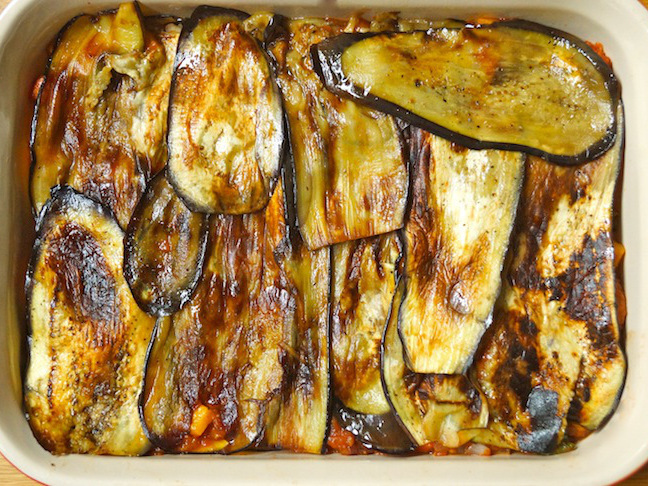 Turn the heat down to90 degrees C.
Step 4: While the vegetables are roasting, prepare the eggplant. Slice about ½ inch off the top and bottom, and then, vertically, cut it into as many thin slices as possible, about ¼ inch thick. 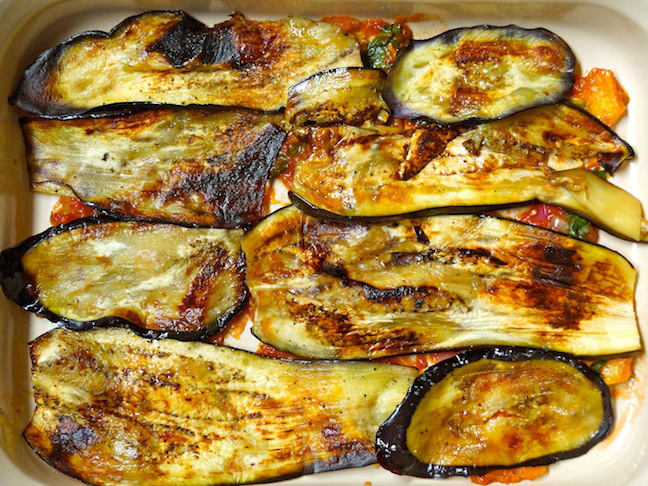 Step 5: Preheat a stove-top grill or very large sauté pan, and in a large bowl gently toss the eggplant slices with the remaining ¼ cup of olive oil. Season generously with salt and pepper, and then grill or sauté them until they are golden brown, about 3 minutes per side. You will likely have to do this in a few batches. Place them on a large plate as you remove them from the grill or pan. Set aside. Step 6: Coat the bottom of a large sauté pan with olive oil, and add the onion and garlic. 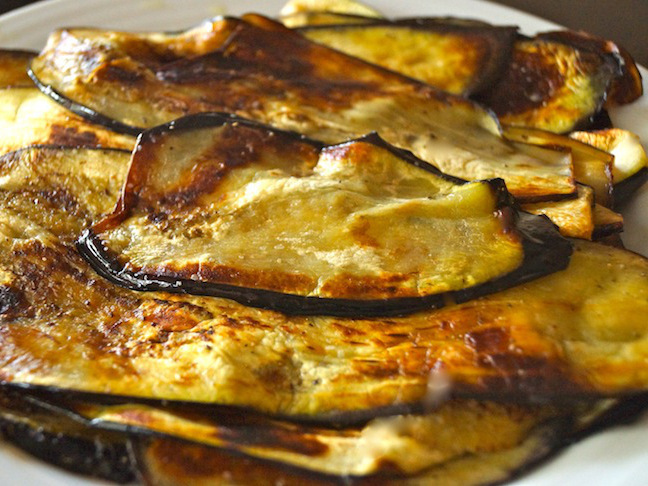 (If you used a sauté pan for the eggplant, use the same one.) Sauté until the onions are caramelized, about 5 minutes. Then add the tomato purée and balsamic vinegar. 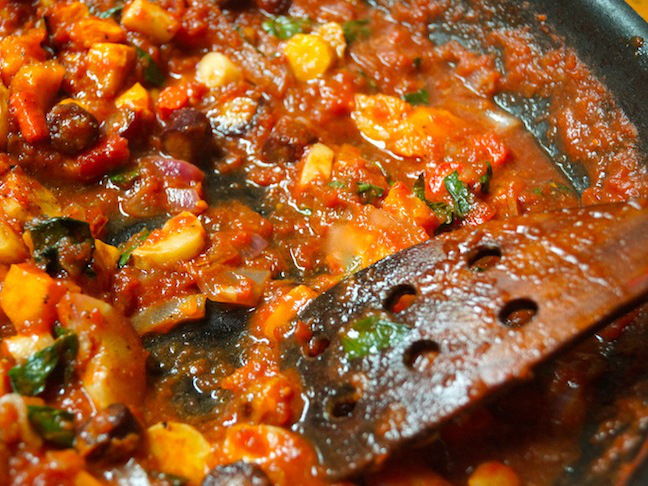 Let this simmer for about 10 minutes, and then stir in the basil and season to taste with salt and pepper. 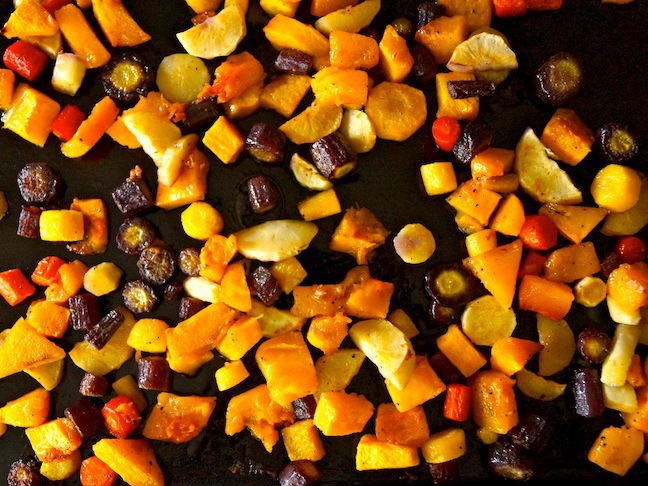 Step 7: Add the roasted vegetables to the sauce and, if necessary, season again with salt and pepper to taste. Step 8: Add about ½ cup of the vegetable mixture to the bottom of a 9 x 13 x 2 inch baking pan, and spread it around. 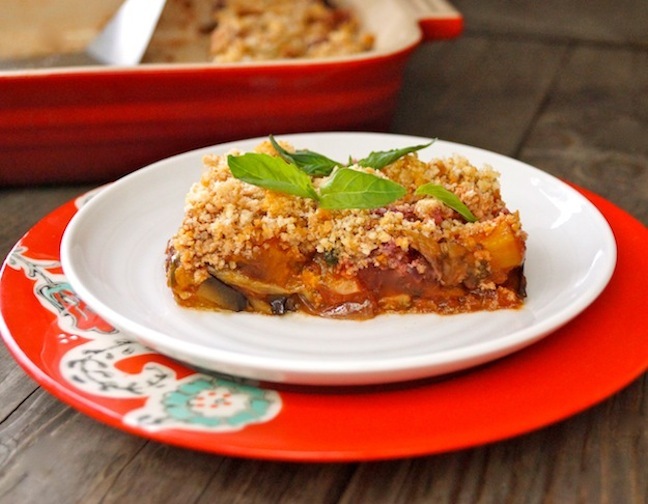 Step 9: Add 1 layer of the prepared eggplant slices evenly over the top. Step 10: Then add about half of the remaining sauce. 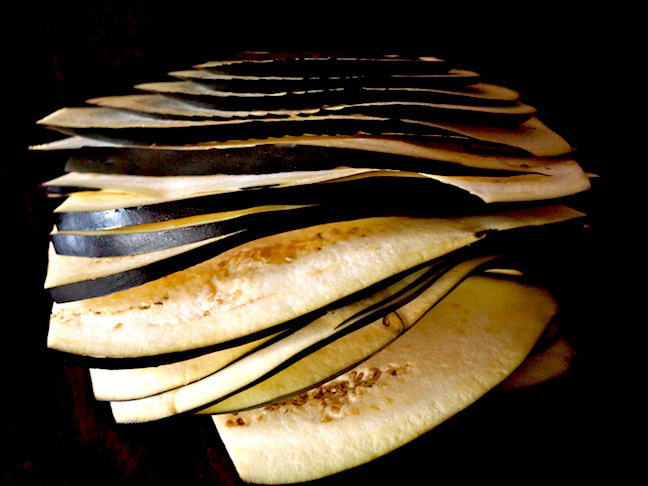 Step 11: Now add another layer of the eggplant slices, in the opposite direction from the first layer. 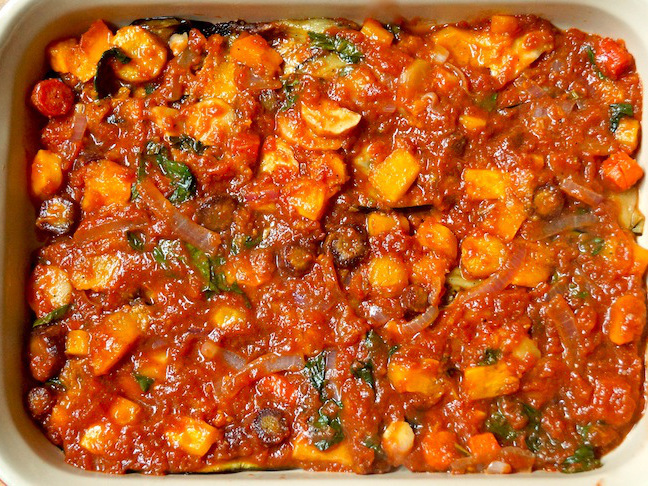 Step 12: Add all but about ½ to 1 cup of the vegetable mixture, followed by any remaining eggplant slices. 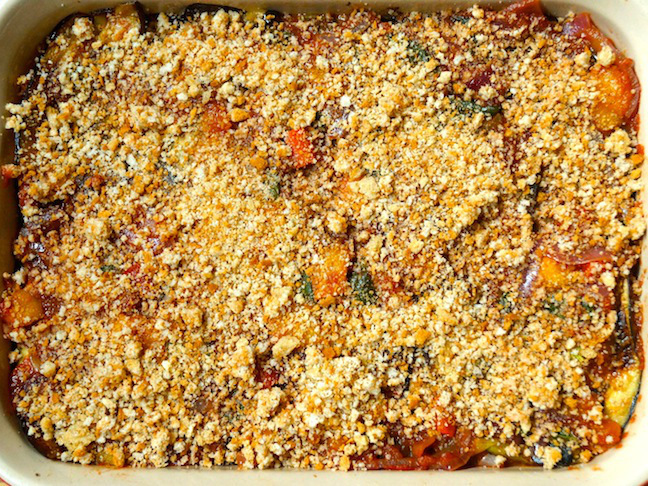 Step 13: Spread the last of the vegetable mixture on top, and then evenly sprinkle with the bread crumbs. Step 14: Place this in the preheated 375 degree F oven and bake until it's sizzling along the edges and the bread crumbs are becoming golden brown, about 15 minutes. Step 15: Let it sit for at least 15 minutes before slicing, and then serve. *You can make this up to two days ahead of time---once it's cooled to room temperature, cover it tightly with plastic wrap or foil and keep it refrigerated. When you're ready to serve, heat it in a 375 degree F oven until it's hot.